The electronic shutter and mirrorless design facilitates super-fast 20fps continuous shooting, with AF/AE tracking as well as silent camera operation. The 693-point phase detection autofocus system also boasts coverage across the entire frame, enabling easier framing and improved tracking, as well as low light autofocus down to –3Ev. Combine all that with its body-integrated 5-axis image stabilization system, effective up to 5 stops, and a maximum 204,800 ISO sensor sensitivity, the a9 shapes up as a performance powerhouse for professional action and low-light photographers. The Sony a9’s 24.2Mp full-frame CMOS sensor delivers outstanding overall performance, achieving a DxOMark sensor score of 92 points, ranking it as one of the best sensors we’ve tested. Its Sports (low-light ISO) score of 3517 ISO is exceptional, putting the a9 in second place for low-light performance, just behind the Sony A7S. At base ISO 50, the a9’s Landscape (dynamic range) and Portrait (color depth) scores of 13.3EV and 24.9 bits, respectively, are very good, if not outstanding, but that’s not the real strength of this new sensor. 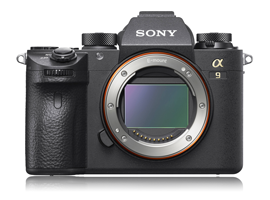 It’s the a9’s performance at higher sensitivities that will appeal more to action photographers demanding fast shutter speeds in low-light environments. On unprocessed RAW files, it achieves excellent color depth of over 20 bits and good color depth (over 17 bits) at ISO 1600 and ISO 6400, respectively. Dynamic range is even more impressive, with the a9 benefitting from the same performance uplift at mid-ISO sensitivities as the A7R II, to offer excellent dynamic range of over 10EV up to ISO 6400. With Signal-to-Noise (SNR 18%) ratios also above an acceptable 32dB up to ISO 3200, low-light photographers can be confident of exceptional dynamic range, good color depth, and well-controlled noise up to ISO 3200. Remember, that’s on unprocessed RAW files, too, so with good in-camera or post-production JPEG processing, very good image quality at higher sensitivities is well within the Sony a9’s capabilities. For our comparison analysis, we’ve pitted the a9 against Sony’s own mirrorless A7 II and A7R II full-frame alternatives, as well as its main rivals in the pro action DSLR market, the Canon 1Dx II and the Nikon D5. If you’re after the best image quality at base ISO, the monster-resolution 42.4Mp Sony A7R II offers over half a stop of improved color depth and dynamic range, a very similar low-light ISO score, and almost twice the sensor resolution of the a9. Featuring a similar-resolution 24.3Mp sensor, the performance of the Sony A7 II is much closer to the new Sony a9, however, with very similar results for dynamic range and color depth results, and a lower low-light ISO score. The Sony a9 comes out on top against the Canon 1Dx II and Nikon D5 with an overall score of 92 points, compared to 88 points for its main action camera rivals. While the Nikon D5 just has the edge for color depth, and the Canon 1Dx II just ahead for dynamic range, the Sony a9 is the more consistent performer of the three at base ISO, offering very good results in all three categories, including the best low-light ISO performance (3517 ISO). For SNR performance on printed images, ratios are almost identical between the three Sony mirrorless sensors, with the a9 and A7R II showing a modest improvement over the A7 II. The Sony a9 offers slightly improved SNR ratios at lower ISO sensitivities compared to the Canon 1Dx II and the Nikon D5, but all three offer effectively the same level of noise between ISO 400 and 25,600. The Sony a9 also boasts an uplift in sensitivity performance at the very highest ISOs between ISO 51,200 and 204,800, where it offers the same SNR ratios at 204,800 as the Nikon D5 at 102,400 — so a one-stop improvement at the top end. The A7R II and A7 II offer around a half-stop advantage for dynamic range at lower ISO sensitivities up to ISO 400, but the real story is the a9’s rise in dynamic range at mid to high ISOs. From ISO 1600, both the a9 and A7R II pull away from the A7 II, with excellent dynamic range over 10EV possible on these sensors up to ISO 6400, compared to just below 10EV on the Sony A7 II at ISO 3200. The same one-stop advantage holds out at the top sensitivities, too, with the a9 and A7R II both offering acceptable dynamic range of over 8EV at ISO 25,600, compared to just below 8EV for the A7 II at 12,800 ISO. Both the Sony a9 and Canon 1Dx II offer better dynamic range at the lower ISOs up to ISO 800 compared to the Nikon D5. All three sensors perform well for dynamic range at mid to high ISOs, which are key for action photographers, with exceptional results up to ISO 6400 and acceptable performance up to ISO 12,800. Sony’s A7R II offers an improvement for color depth at sensitivities up to ISO 12,800, with one stop better color at most low to mid ISOs, and excellent color of over 20 bits at ISO 3200, compared to ISO 1600 on the a9 and the A7 II. The a9 and the A7 II are also very comparable up to ISO 1600, but again, the a9 pulls away a little at those higher sensitivities to narrow the gap with the A7R II, with both offering similar dolor depth at ISOs 12,800 and 25,600. Color depth results are much closer between the Sony a9 and the pro Nikon and Canon DSLRs. Despite a very modest improvement in color at the lowest ISO sensitivities for the a9 and the D5, the scores are almost identical between ISO 400 and ISO 25,600, with a minor boost for the a9 at the highest ISO sensitivities. For greater insight into the performance of alternatives to the Sony a9, see our Nikon D5, Canon 1Dx II, Sony A7R II and Sony A7 II sensor reviews.